Fish encompass a diverse assemblage of aquatic vertebrates that have fins (if any) rather than limbs, and gills for breathing throughout life. In Greenlandic, aalisakkat is the word for fish; in Russian, the word is Pti6a. In Alutiiq and in the north Baffin Island dialect of Inuktitut, the word for fish, iqalluk, also refers to salmon or trout; in the Central Yup'ik language, neqa or neqet refers both to fish and food, emphasizing the importance of salmon as fish and fish as food. Indigenous peoples of the Arctic have a refined vocabulary for referring to individual species and even subpopulations of fish. For example, the Saami have seven different names for distinct sizes, classes, stages of life history, and sexual maturity of Atlantic salmon (Salmon salar), and the Inuit of northern Baffin Island recognize three distinct forms of Arctic char (iqalup-pik), Salvelinus alpinus. The term "fish" does not correlate with a specific taxonomic rank, but is used to refer to individual species of three major taxonomic lines that do not include all descendants of a common ancestor, thereby excluding tetrapods (four-footed creatures). Fish are the most numerous and diverse of the major vertebrate groups, constituting more than half of the world's living vertebrate species, with 482 families and almost 25,000 recognized species (Nelson, 1994). Two superclasses, Agnatha and Gnathostomata, within the phylum Chordata and subphylum Vertebrata encompass the species that are typically classified as fish. Agnatha are jawless, long, and cylindrical animals without ribs or paired fins and include the hagfishes and lampreys. Their teeth are horny, their skeletons are cartilaginous, and they are typically scavengers, parasites, or predators on larger fish. Hagfishes are the most ancestral line of modern fish, and are not even considered true vertebrates by some taxonomists. Several species occur in the Arctic such as Atlantic hagfish and Arctic lamprey. Although humans consume some species, such as the European lamprey, many fishermen consider hagfish and lampreys a nuisance because they destroy or scar the host fish on which they feed as parasites. The Gnathostomata encompass three classes of jawed fish with living species: Chondrichthyes, Sarcopterygii, and Actinopterygii. The Chondrichthyes possess cartilaginous skeletons, hard teeth, scales that are either absent or toothlike, and well-developed jaws. The Chondrichthyes comprise two main groups, sharks and rays (elasmobranches), and chimaeras. The Greenland shark, Somniosus microcephalus, which grows up to 8 m in length, is one of the most prominent Arctic elasmobranches. The Inuit harvest the Greenland shark for subsistence use of its skin and oil, and also sell them commercially. The class Sarcopterygii includes lobe-finned bony fish and the class Actinopterygii includes ray-finned bony fish. The Sarcopterygii, thought to have given rise to the vertebrate tetrapods (that is amphibians and reptiles), include coelacanths and lungfishes and are not found in the Arctic. The Actinopterygii contain the majority of the world's living fish species as well as most of those found in the Arctic, including many prominent Arctic species in the following families: Cottidae (sculpins), Cyclopteridae (lumpfishes), Zoarcidae (eelpouts), Liparidae (snailfishes), Pholidae (gunnels), Gadidae (cods), and Pleuronectidae (right-eye flounders). Fish dominate the marine and fresh water, tropical, temperate, and polar waters of the world and exhibit a tremendous diversity of form, physiology, life cycle characteristics, behavior, and habitat. They live in all types of aquatic environments, including open ocean, coastal continental shelf, littoral (shoreline waters), lacustrine (lakes), and fluvial (streams and rivers). Within these environments, fish occupy a wide variety of niches and are found at all depths from pelagic (surface) waters to demersal or benthic waters (on or near the bottom). Although fresh water accounts for a small percentage of the total waters of the world, 40% of all fish occur in or usually in fresh waters. Almost 200 species are diadromous, that is, living part of their lives in fresh water and part in marine waters. Most of these are anadromous, meaning that they spawn in fresh water but spend much of their life at sea. Fewer are catadromous, that is, they spawn in marine waters and return to fresh water to live much of their lives. Anadromy has been a very successful life history strategy in the Arctic. This may be because it confers a high degree of flexibility to the fish, facilitating their exploitation of newly emerging postglacial habitats. The Salmonids are the dominant anadromous family with 11 anadromous species found at least as far north as 71° N.
The marine Arctic region has relatively few fish species (probably fewer than 110 species are found on a regular basis) and low endemism (20-25%) (endemism refers to species that are indigenous and confined to a certain region) compared to other regions of the world (Moyle and Cech, 2000). 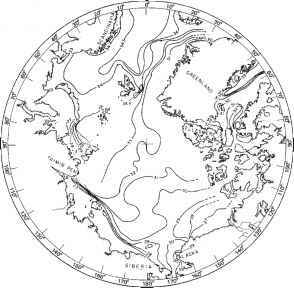 Arctic fish tend to be circumpolar in range. Many are cold-tolerant species that also occur in the North Atlantic and North Pacific and, with recent climatic warming trends, several have extended their ranges north into the Subarctic and Arctic regions. Examples include the Atlantic cod (Gadus morhua), the pollock or coalfish (Pollachius virens), the ling (Molva molva), and the haddock (Melanogrammus aeglefinus). Most are demersal, feeding on benthic organisms such as molluscs or crustaceans. Only a limited number of fish species are found in the Arctic; many are temperate species at the northern edge of their range. The anadromous Arctic char may be the most northerly occurring fish species found in fresh water, identified in Lake Hazen on Ellesmere Island in Canada (81° N). Two freshwater species, burbot (Lota lota) and northern pike (Esox lucius), are circumpolar in distribution. Approximately 55 freshwater fish species occur in the Canadian Arctic. Many fish species have developed physiological mechanisms to withstand the extremely cold-water temperatures of the Arctic. Arctic and Greenland cod produce glycoprotein antifreezes to keep their bodies from freezing; other species produce peptide antifreezes. These proteins are found in the blood of certain fish and prevent freezing by binding to ice crystals and inhibiting their growth. Some fish can decrease the production of antifreeze compounds in the summer months in order to tolerate the higher temperatures. Fish play a significant role in the functioning of aquatic Arctic ecosystems. Many fish species produce large eggs in shallow waters. The larval fish spend their first months floating in surface waters and comprise an important component of the zooplankton, consumed by marine mammals, seabirds, and fish, and descending to deeper waters at the end of summer. Arctic cod, Boreogadus saida, are a valuable source of food for many bird and marine mammal species, including the ringed seal. Additionally, Arctic cod, Polar cod (Arctogadus glacialis), and American sand lance (Ammodytes hexapterus) are characteristic and important faunal components of the sea-ice ecosystem. Fish (especially capelin (Mallotus villosus), char, pike, grayling (Thymallus arcticus), herring (Clupea harrengus), several species of whitefish (Coregonus spp. ), flatfish, cod, and salmonids) are important subsistence foods for Arctic peoples. Intensive fishing forms the basis of subsistence for the Koryak, Itel'men, and Yup'ik Eskimo. A study of 98 Alaskan communities found that subsistence-fishing output was higher than hunting, comprising 57-68% of total subsistence output, up to 1239 pounds per capita, for example, in the village of Hughes situated on the Koyukuk River (Wolfe and Walker, 1987). Fish are also an important component of the ceremonial diet of Arctic peoples, accorded a place of prominence in the feasts marking significant events such as deaths, marriages, and births. Large commercial fisheries provide the primary source of income and employment in many areas. Some of the world's largest fisheries are located in the Subarctic waters of the Bering and Barents seas. Combined with a highly valued recreational fishery (targeting lake trout, Arctic char, Arctic grayling, walleye, and northern pike among others), fish constitute the largest and most lucrative living resource in the region. The worldview of many indigenous peoples of the Arctic holds that the natural world is spiritually endowed. Living organisms have spirits and must be accorded respect and treated appropriately, and a variety of prohibited and permitted behaviors are stipulated within different cultures. Strong prohibitions against waste dictate that what is caught should be used or consumed. In the spiritual world of the Koyukon Indians, fish have unnamed spirits that are powerful but less powerful than named spirits. In contrast to this, nets and traps used to capture fish have very powerful spirits, and harsh punishments such as sickness or death may result from stealing fish or using gear without permission (Nelson, 1983).